Review of Brahmin Capitalism: Frontiers of Wealth and Populism in America’s First Gilded Age by Noam Maggor. Between the end of the Civil War and the early 20th century, the United States underwent one of the most profound economic transformations that any country has ever experienced. “One can hardly believe there has been a revolution in history so rapid, so extensive, so complete,” wrote John Dewey in 1899, referring to the nation’s new economy of coal, iron, and steam. In 1865, the United States lagged far behind Britain in manufacturing output; by 1900, it would surpass the totals of Britain, France, and Germany combined. The rapid expansion of the railroad network created an integrated national market for manufactured goods. Meanwhile, the financial system was consolidated under the control of Wall Street. These changes led to the emergence of a new plutocracy that enjoyed previously unimagined wealth. What Noam Maggor, in his new book on this period, Brahmin Capitalism, calls “the origins of modern capitalism in America” also provoked popular insurgencies that sought to tame the rampant inequality of wealth and political power, and some of the most violent labor conflicts in modern history. Maggor exemplifies a generation of young historians whose work, inspired in part by the 2008 financial crisis, sheds new light on the history of American capitalism. Of course, this is a subject that has long attracted the interest of historians. But as Maggor notes, too often the emergence of the modern economy has been presented as an “almost automatic” process. In retrospect, the triumph of industrial capitalism can seem inevitable, the result of inexorable economic forces rather than human decision-making and political and social conflict. Many historians of capitalism choose to breathe life into the story by focusing on the economic shenanigans of the fabled “robber barons” like Jim Fisk, who tried to corner the gold market, and Jay Gould, the manipulator of railroad stocks, or on individual “titans of industry” like Andrew Carnegie and John D. Rockefeller. But for Maggor, the history of capitalism is “much more than the history of capital and capitalists.” While primarily interested in the managerial techniques and financial strategies of elites, he is also careful to show how ordinary Americans responded to the economic revolution. His basic point—and this is what unites his work with the burgeoning cottage industry examining the history of capitalism—is that the system was created, not imposed by natural forces, and that its final shape was the result of conflict at all levels of government and society. Moreover, since capitalism is a total system, investigations of its history must move beyond the narrow sphere of economics to all aspects of society. Thus, at its best, the new history of capitalism has absorbed the insights of labor history, business history, cultural history, the history of women and the family, and the history of the state (sometimes to the dismay of practitioners in these subfields, who fear being swallowed up by this latest scholarly tendency). And while capitalism is a global system, its specific form is shaped by distinct local and national circumstances. Thus, Maggor writes, different “geographical scales of analysis” need to be kept in view simultaneously. Bearing these strictures in mind, Maggor has produced a complex, fascinating account that is rich in local detail yet asks some very large questions, among them: How did human choices shape the development of the industrial economy? How does a ruling class exercise its power? And what forms of resistance at the local level did capitalist development engender? His focus is on the role of Boston financiers in reorienting the American economy away from its pre–Civil War emphasis on cotton (cotton production in the slaveholding South, cotton manufacturing in New England) and toward what he calls “continental industrialization.” Maggor shows how, after the war, the members of Boston’s moneyed elite mobilized their wealth to invest in railroads, mines, stockyards, and other enterprises in the rapidly growing American West, and how they tried to shape a political system conducive to their pursuit of profit. His chapters alternate between Boston and the West, a structure that in some ways seems at odds with his argument about the symbiotic integration of the two places, but which allows him to offer in-depth local analysis within the larger framework of change over time. Maggor’s book also reflects other recent trends in historical writing. A notable one is the ongoing integration of the history of the American West into the national narrative. Ever since Frederick Jackson Turner announced his frontier thesis in 1893, historians have been aware of the central role that the West played in American development. But until recently, western history has been isolated from other aspects of the country’s experience. And in the popular imagination, the West remains a land of lone pioneers, cowboys, and intrepid homesteaders. In fact, thanks in large measure to investment from the East, the post–Civil War West became a rapidly expanding capitalist economy, the site of burgeoning cities (in 1890, a higher percentage of its population lived in urban areas than in other regions) as well as modern mines, logging operations, and other capital-intensive enterprises. Maggor begins Brahmin Capitalism in the early days of Reconstruction, immediately following the Civil War, when a group of Bostonians invested in an attempt to grow cotton using the labor of newly emancipated black workers. The effort, he points out, was in keeping with Boston’s prewar economic status as the hub of the country’s major manufacturing region, whose factories produced textiles from slave-grown cotton. But when this effort failed, a new generation of Bostonians sought to revitalize the elite, and transform Boston’s economy, by turning their attention to investment opportunities in the West. These young men were hardly the “declining, detached, and effeminate elite” later depicted in the novels of Edith Wharton and others. Energetic, ambitious, and forward-looking, some of them had fought for the Union, and nearly all undertook strenuous journeys to survey the new investment opportunities. By redirecting the city’s interests toward the unspoiled lands of the West, they reconfigured Boston as a major financial center and transformed the American economy. Much like Marx and Engels in The Communist Manifesto, Maggor despises the inequality and exploitation that the actions of this bourgeoisie entailed but cannot suppress a sense of awe at their world-shattering impact. Boston investors transformed the Calumet mine in Michigan into the nation’s largest copper operation, with modern technology and a giant new labor force. Charles Francis Adams Jr., the grandson and great-grandson of presidents, engineered the reorganization of the Kansas City Stock Yards Company, purchasing land, building new cattle pens, and installing modern equipment. Under his direction, the previously small-scale cattle business became centralized and modernized, and Kansas City experienced a boom in banking and real estate, from which the Bostonians profited. Maggor devotes an entire chapter to Henry Davis Minot, a member of one of Boston’s wealthiest families, who died in 1890, at the age of 31, in a train wreck in the West. As a youth, Minot had devoted himself to ornithology, producing an immense guide to the birds of New England. After a nervous breakdown, he secured a job with a Boston investment house and turned his powers of observation to the stock and bond markets, especially western railroad securities. He embarked on expeditions to judge for himself the region’s terrain, soil quality, and mineral wealth, all of which helped determine the potential profitability of individual rail lines. He even ventured into Mexico to investigate prospects for railroad development there. Minot’s activities paved the way for other Boston Brahmins to invest heavily in railroads. He and the others, Maggor writes, did not mind forming economic alliances with “westerners of no social pedigree” and worked happily with shady characters as long as the profits continued to flow. As the transformation of the western economy proceeded, with investment flowing from the East and profits making the trip back, laborers, small businessmen, and farmers sought ways to turn economic development in a more egalitarian direction. Suffused by what Maggor calls “populist” ideas, they drew on long-standing American values. Their critique of financial elites as nonproducers whose profits came at the expense of honest laborers dated back to the American Revolution and Andrew Jackson’s war on the Bank of the United States; their emphasis on the centrality of free labor to the promise of American life was a commitment grounded in the struggle against slavery and sanctified by the Union’s victory in the Civil War. At a time when the term “populist” is applied promiscuously by pundits to anyone who claims to speak for the ordinary man and woman, from Bernie Sanders to Donald Trump and Marine Le Pen, Maggor takes us back to the term’s original meaning: those who wish to use the democratic state to curb the power of economic elites and promote a more egalitarian path of economic development. Maggor makes clear that this was not a battle between the forces of modernity and latter-day Luddites yearning for a mythical agrarian past (an interpretation of the agrarian revolt presented most memorably in Richard Hofstadter’s The Age of Reform). Rather, it was a serious nationwide debate over the shape of the emerging order between proponents of low taxes, minimal governmental regulation, and the unrestrained pursuit of profit, and those who believed that economic enterprise should be embedded in a democratic framework and regulated for the public good. Maggor examines in detail the little-studied proceedings of the conventions that framed the state constitutions in territories like Montana, the Dakotas, Idaho, and Wyoming in the 1870s and 1880s. His populists insisted that eastern investors should not reap all the benefits of economic development in their states. They advocated government regulation of the railroads, the protection of workers’ rights, an end to child labor, guaranteed access to water for small farmers, and the taxation of out-of-state investors’ profits. For their part, the Bostonians wanted, above all, a secure political framework to protect private property, which translated into laissez-faire, low-tax state governments. The outcome would differ from convention to convention—­delegates had to balance their desire for fairness with the need for capital investment—but on railroad regulation, the populists won significant victories. For example, the State Constitution of Idaho, not known today as a hotbed of radicalism, authorized government oversight of railroad freight rates and prohibited the Legislature from granting tax breaks and subsidies to private businesses. The Boston-financed capitalist development of the West, Maggor notes, had powerful reverberations at home, and the city experienced its own version of the political debate over economic change. Despite the economic power of Boston’s financial elite, it encountered huge difficulties in trying to bend the city government to its will: “private wealth,” writes Maggor, “did not translate seamlessly into political influence.” Boston’s elected officials, many of them shopkeepers, small businessmen, and skilled craftsmen, were more interested in promoting manufacturing than finance. They attempted to use city government to provide infrastructure and expand services—roads, sewers, libraries, parks—to working-class districts and to make affordable housing widely available. All of this meant raising taxes, which was bitterly resented by the elite. The city’s fiscal system, based on a general property tax, “border[ed] on communism,” declared one outraged businessman. In New York City in the 1870s, businessmen who hoped to reduce taxes and social spending drafted a new city charter that limited the right to vote in municipal elections to property owners. Not surprisingly, the electorate resoundingly rejected it. Realizing that people do not generally vote to disenfranchise themselves, the Boston elite took a different approach, pressing for reduced municipal spending and a shift in taxation, placing the burden on owners of real estate and their tenants and exempting the financial assets and incomes of merchants, lawyers, and other nonproducers. They also opposed the city government’s absorption of nearby towns into Boston, which added to the land available for working-class housing but required more municipal spending. Maggor sees in this conflict not simply the normal clash of economic interests but also a battle between two visions of municipal government and the shape of Boston’s economy. The difference, he writes, emerged in sharp relief in 1877, when the Massachusetts Charitable Mechanic Association asked the city government for permission to hold an industrial exhibition, including steam engines, craft wares, and other mechanical products, on Boston Common. The city’s elite vigorously denounced the proposal: An industrial exhibition, they claimed, would subject the citizens to noise and dirt in a site meant to encourage the contemplation of nature. Moreover, it would tarnish the city’s image. Boston had emerged after the Civil War as a center of small manufacturing businesses, but the city’s elite wanted people to think of it instead as a financial hub and a center of culture (a few years earlier, the Brahmins had founded the Museum of Fine Arts). In the end, the industrial exhibition did not take place on Boston Common, but the elite’s efforts to reduce taxes and spending achieved only a fitful success. 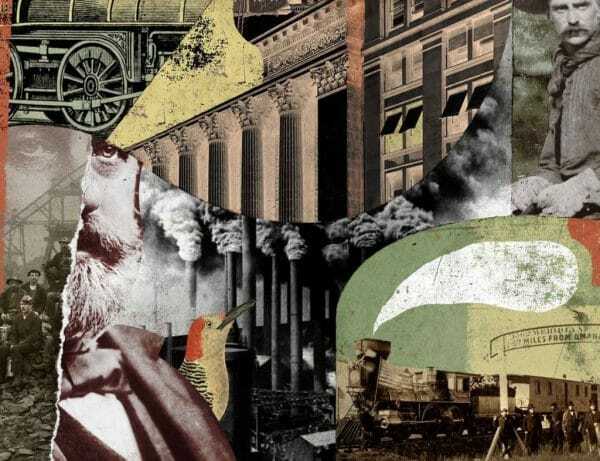 Brahmin Capitalism is an important contribution to the growing literature on the history of capitalism in the United States. Sometimes, as is often the case with first books, Maggor’s claims outstrip his evidence. One wonders, for example, whether the economic transformation of the late 19th century can really be explained from the vantage point of a single city, especially when the era’s real financial powerhouse—Wall Street—is pretty much ignored. New York merchants and financiers also moved into the West after the Civil War, and they had more resources at their disposal than their Boston counterparts. J.P. Morgan makes a cameo appearance at the end of the book, but there is only a brief mention of the merger movement at the turn of the 20th century presided over by Morgan and his financial collaborators, who were based in New York. Nor is it possible to assess the impact of western investment on the growth of American capitalism without comparing it to investment in the region around the Great Lakes, the heartland of the industrial economy. Maggor is correct to emphasize the importance of local struggles over the consequences of capitalist development. But his focus on local centers of power comes at a cost: an almost complete omission of the national context. When stymied at the local and state levels, emerging capitalists could always find a sympathetic ear in Washington, and national policies like the protective tariff and the national banking system, the use of troops against strikes, and the “liberty of contract” jurisprudence of the US Supreme Court (which consistently struck down state laws regulating economic enterprise as violations of corporate freedom) all certainly helped to facilitate capitalist development. Then too, while rightly stressing local resistance, Maggor says nothing about the Knights of Labor, which flourished in the West as well as the East, or the era’s greatest citizen movement to rein in corporate power, the People’s Party of the 1890s (the original Populists), which had a broad base in the South, Midwest, and West. Usually, it’s unfair to chide an author for how he defines the subject matter of his own book, but at 211 pages of text, Brahmin Capitalism does have the space to address more of these aspects of the era’s history without becoming overlong. Nonetheless, Maggor’s book offers us an important reminder of the broad impact of capitalist development and the bitter conflicts it engendered. With its vast inequalities of wealth and power, business dominance of the national government, and nationwide debates over taxation, spending, and economic regulation, the era that Mark Twain dubbed the “Gilded Age” bears more than a passing resemblance to our own. Then and now, the key issue facing American society was as old as the republic itself: Is it possible to reconcile capitalism and democracy? On this question, the jury is still out.